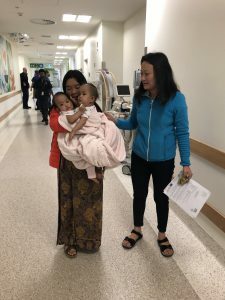 The life changing surgery to separate Bhutanese conjoined twins Nima and Dawa began at Melbourne’s Royal Children Hospital this morning. Fifteen month old Nima and Dawa, who are joined at the abdomen, have won the hearts of Australians since their story appeared in the Herald Sun on 2 October. The hospital has gathered a team of 18, including surgeons, anaesthetists, technicians and theatre nurses, for today’s surgery. Mum Bhumchu said she felt ‘happy’ that today had arrived, but she is understandably nervous. She will spend the day praying at a Buddhist Temple supported by members of the Bhutanese community and paediatric nurse Tshewang who travelled with mum and girls from Bhutan. Surgeons at the RCH decided against surgery that was planned for 12 October to enable the girls to receive further nutritional support. During this time they were cared for at Children First’s Miracle sMiles Retreat in Kilmore, supported by visits from the hospital’s Hospital in the Home team. This delay proved beneficial with the girls gaining 2 kilos. The girls enjoyed the attention of the other children staying at the Retreat while Bhumchu also benefited from a healthy dose of TLC from the staff and volunteers at the Retreat. She has been truly touched by the messages, letters and gifts sent to her and her daughters. 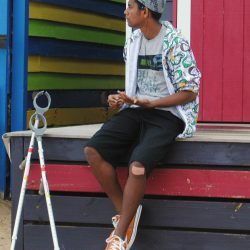 We look forward to sharing the outcome of surgery with you….